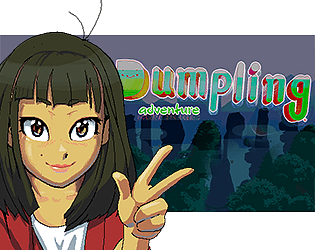 Asian girl walking simulator , jump on hotdogs and hamburgers !! The ledge grab animation with the first wall is a little buggy, and there were some animation errors with the box push animation (push the box then walk away and you'll stay in the box push anim). You can spam projectiles at the little coin block thing and interrupt its shrink animation to keep spawning coins, don't know if that's intentional or not. The game hits a permanent black screen if you transition from to the underwater part then immediately go up to the previous screen. Had to restart to keep playing. The ledge in the cave next to the angled blue and green tiles is super hard to get to. I only grab it randomly it seems. The level cleared screen showed that I had a time of "00:00:000". Overall, it was really fun. Even after having to restart the level a few times I keep playing, so that's a good sign. Keep it up! Checked it out with DS4Windows and everything seems to work alright, though I would suggest adding keyboard controls at some point, even if aiming the dumplings might be a little awkward. The speed of the camera when changing which direction you're running in is a little fast and disorientating. The art is really nice! Love that the grass naturally sways and reacts to you moving on it. That plus the music gives the whole game a comfy adventure feel to it. The last room with the pink floor made me want to eat my own hat because of how annoying the rocks were, but it was an enjoyable last challenge at least. Can't play it properly because I only have a generic USB controller/10, I can move with the arrows keys but the other buttons only work on the controller, which is pretty uncomfortable, please do something about that. Besides that I can say that the art is damn fine, the colors are kinda weird, like too colorful at least for me, but the technique is there.